The COMET stops and shelters are hard to miss. Each is designed with bold colors and the route numbers are clearly displayed. Transit stop signs list the routes that serve each stop and will coincide with the numbers on the bus. Your bike can ride along with you for free. Each COMET has a bike rack with room for two bikes. Because drivers are responsible for the safety of all passengers, he or she is not able to help load your bike. 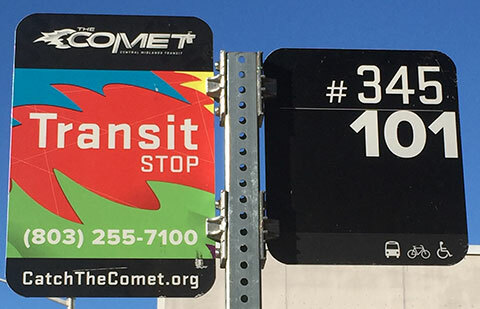 The COMET assumes no responsibility for items left on the bus or on your bike or for bikes that are damaged while in a bike rack. First, find your routes by using our live tracker here. Identify the route nearest the place you are starting and the one nearest where you are going (there might be more than two needed, depending on your trip). Then, look at the schedules for the routes you need. Look at the colored bar at the top underneath the map to make sure it says “weekday” or “weekend” depending on when you are riding. A route’s frequency and hours of operation change on the weekend. See example of Route Map #42 Millwood Avenue. The map on the schedule shows numbers in circles along the route. 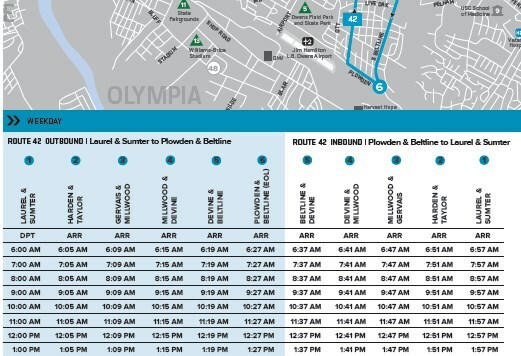 That number is called a time point and corresponds with the list of names and times on the schedule below the map, giving an estimated time a bus will get to an area. 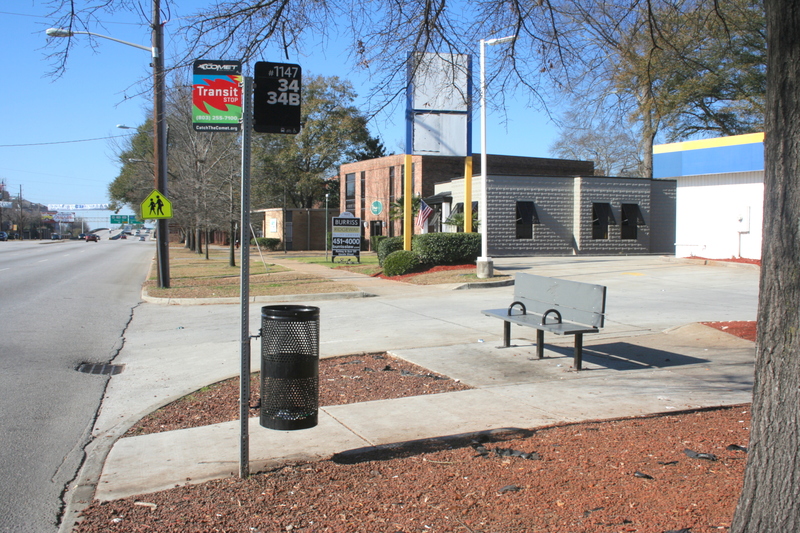 If your stop is a timepoint be at the stop about five minutes before the scheduled arrival. If your stop is between time points estimate based on how close you are to either point and to be at the closest stop six minutes ahead of schedule. Remember if you use our live tracker you can see the bus moving in real time and get alerts when the bus is near your stop. The tracker shows every stop in the system so you can easily find the one nearest you. If you are still having trouble locating a stop, call us at 803-255-7100. As they say, all good things must come to an end. When you’re about a block from your destination, press the yellow, pressure-activated strip or yellow pull cord above your seat to let the driver know you are ready to exit. Please exit through the rear side door of the bus so people boarding can use the front door. We want your ride with us to be out of this world. That means affordable, clean, safe, enjoyable, convenient and on time. To help make it a stellar trip for you and your fellow passengers, please observe the following rules of courtesy. Additionally, a complete list of rules and regulations can be found here. Threats of physical harm to other passengers, bus operators, or any other service personnel. Physical assault or battery on the bus operator or other passengers. Verbal abuse, including the use of profanity, intimidation, or altercation with the bus operator or other passengers. Harassment of bus operator or other passengers. Repeated violation of riding rules, including smoking in the vehicle, eating, or drinking on the vehicle. Failure to maintain reasonably acceptable personal hygiene standards, which could expose passengers and bus operators to health and safety risks. Any criminal conduct prohibited by the South Carolina Code of Laws and its Section 58-23-1810, The Public Transportation Passenger Rights Act. Service will immediately be suspended to passengers who engage in Suspendible Conduct, and a notice of suspension will promptly be mailed to the passenger. The COMET shall conduct an investigation of the Suspendible Conduct that shall include interviewing the passenger and/or other passengers present and/or involved in the Suspendible Conduct and reviewing surveillance video footage. The COMET shall make a determination regarding the length of the suspension within ten (10) calendar days from the date of the incident resulting in the suspension. In determining the length of the suspension and the conditions for the reinstatement of the suspended passenger’s riding privileges, The COMET shall consider the cause of the Suspendible Conduct and The COMET’s ability to resolve the matter in conjunction with the suspended passenger and/or the other parties involved to ensure that the Suspendible Conduct will cease. Past incidents of Suspendible Conduct will also be considered in determining the length of the suspension. Passengers may appeal the suspension of service by contacting The COMET. Travel training is a free service provided by The COMET to educate individuals or groups on how to plan a trip, read bus schedules, purchase fares, use technologies, and board and alight the bus. This service is available to anyone within the community who seeks assistance in learning how to use public transportation. Individuals who use this service will be able to navigate confidently through the Midlands by using our fixed-route (big bus) or flexible transportation services. This service is not in conjunction with DART paratransit. Click here to view our complete travel training brochure. Individual travel training sessions are conducted by The COMET’s travel trainer who has experience working with individuals who have disabilities but there is no requirement for a disability to use the service. Anyone who just needs extra help figuring out how to Catch The COMET should feel welcome giving us a call. Group travel training presentations can be arranged for agencies that provide services to individuals with disabilities, adults, and youths. Participants will learn of various services and programs offered by The COMET. To sign up for travel training, contact The COMET at (803) 255-7130 or by email at Brittany.Higgins@catchthecomet.org. Do you have interest in becoming a volunteer Travel Trainer for your organization? For more information contact Brittany.Higgins@catchthecomet.org or call 255-7130.